No sleep til Brooklyn! 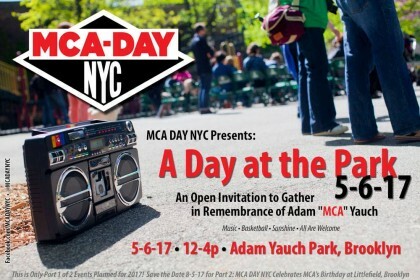 The organizers of MCA Day are hosting “A Day in the Park” in honor of beloved Beastie Boy, Adam “MCA” Yauch. The event takes place this Saturday, May 6th in Adam Yauch Park from Noon to 4pm. Come bask in the sunshine at Adam Yauch Park, play some basketball, listen to some music and gather with a community of people dedicated to keeping Yauch’s legacy burning strong. As always: all ages & free for all lifestyles, shapes and forms. Come join us! Today, (Thursday) May 5th marks the fifth anniversary of Yauch’s passing. Palmetto Park, where he played basketball as a child, was renamed in his honor in May of 2013. Yauch, a Brooklyn Heights native, parlayed his notoriety into activism. After becoming Buddhist, Yauch organized the Tibetan Freedom Concert, a concert still held annually at Carnegie Hall. Saturday’s gathering is a celebration of his life and music.